← And the votes are in! Michele from Veggie Num Nums has the recipe and that gorgeous bread in her house. And Teresa of The Family That Bakes Together has the recipe as well. Delicious loaves for the novice and experienced baker alike! Wish I had made 2! whoops, posted in the chatter post by accident! I added Italian Seasoning. Good stuff!! Not my best effort–but it was me not the recipe! 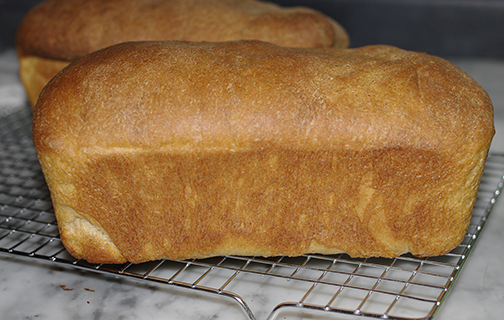 Of course, I had to play with the second loaf–great recipe! we loved these! cinnamon raisin swirl! Great toasted in the morning for breakfast and for sandwiches at lunch! I’m so glad I made this one already! Mmm, such a good recipe! Not the last…but it’s still tuesday in the USA! Sorry I’m so late…this one was a real winner!! Oh my, is it still Tuesday? What’s not to love about this lovely loaf? It’s still Tuesday in Maryland! Yours is one of the blogs I can’t comment on, so just wanted to let you know here that ‘insane ingredient’ is a great tag. Nice job on the bread, too. Molasses instead of malt extract! Great bread! Tough on the mixer! Made a great grilled ham and cheese! So I tried posting yesterday and it didn’t work. Maybe it thought my link was spam? a little late but delicious! Early to bake, but late to post. A nice wheat loaf, even better as toast! I finally cut the apple loaf. Here it is! I really like this recipe and I know I will make it again. I’ve joined your feed and look forward to seeking more of your fantastic post. Also, I have shared your web site in my social networks!